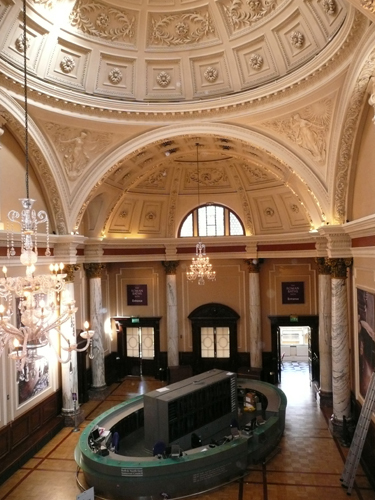 The reception hall at the Roman Baths and Pump Room site was completed in 1897 as a concert hall extension to the Pump Room. The extension was part of a larger programme of works which was designed to develop the facilities offered by the spa town of Bath. The aim was both to compete with spas overseas and elsewhere in the country and to enclose the extra width of the baths complex occasioned by the discovery of the Roman Baths in the 1880s. The new concert hall was built by John McKean Brydon in 1895-7. It provided a dedicated venue for the Pump Room orchestra which had been established earlier. The surrounding marble corridors provided space for the display of antiquities from the recently discovered Roman Baths and the building scheme included a terrace overlooking the baths. 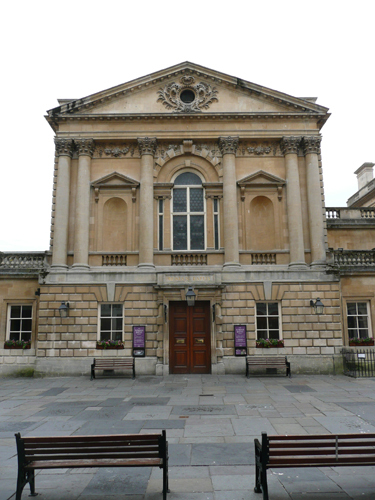 Visitors to concerts could step out from the room to take the air and view the baths below through an unglazed loggia over the north side of the Great Bath. I was employed to investigate the earlier schemes of decoration applied to the Reception Hall. The room had been decorated on seven occasions. Most of these schemes have consisted of a simple stone colour. The sixth one, which was applied in 1962, was more colourful, with blues and browns being applied to the coffer beds and a red-brown frieze. It appears that the Hall was first given an interim scheme of decoration in an off-white soft distemper. 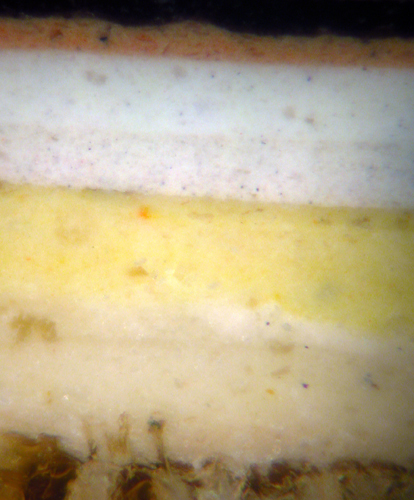 The Hall was redecorated a few years after opening, but this time a stone-coloured oil paint was used. The column capitals have been gilded on three occasions, the gilding being “carried over” three times. Interesting piece (with the only good pictures I could find of the Hall. Did you know that Bryden had plans to ornately decorate the hall and after his death it was proposed to do so with the help of John Robert Brown (1850-1918) of London (he was also a ‘Special Artist’ for the ‘Graphic’ and ‘Black and White’ magazines). It all descended into a row about money and the scheme was abandoned. I have the newspaper clipping of the rather stormy council meeting should you wish to view it. Very many thanks Colin. How very interesting. I would happily add a short piece if there is something that I may add.